In Chapter 32 we discussed some of the primary causes of 'mental retardation' . Mostly we looked at disabilities that come from inside a child's head- conditions where the brain has been damaged, is too small, or for other reasons is not able to work as quickly as other children's brains. In this chapter we see how a child's early development also depends on factors outside the child's head-on the opportunities a child has to use his senses, mind, and body to learn about the things and people around him. We look at the stages or steps of normal child development, and at ways we can help or 'stimulate' a child to learn and do things more quickly. 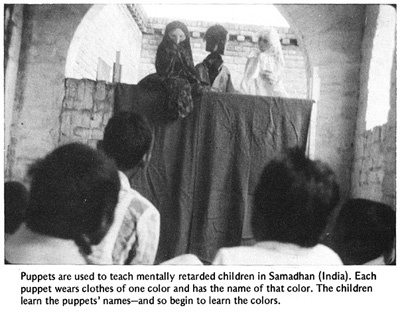 Our concern is not only to help children who are 'mentally retarded', but those whose development is slow, or 'delayed', for whatever reason. Usually children whose minds are slow to develop are also slow in learning to use their bodies. They begin later than other children to lift their heads, roll, sit, use their hands, stand, walk, and do other things. They are physically delayed because of their delayed mental development. In other children the opposite is true. Their minds are basically complete and undamaged, but certain physical disabilities make it harder and slower for them to develop the use of their minds. For example, a child who is born deaf but whose brain is normal will have difficulty understanding what people say, and in learning to speak. As a result, she is often left out of exchange of ideas and information. Because language is so important for the full development of the mind, in some ways she may seem 'mentally slow' for her age. However, if the child is taught to communicate her wishes and thoughts through 'sign language' at the age when other children learn to speak, her thinking power (intelligence) will often develop normally (see Chapter 31). On the next page is a true story that shows how a severe physical disability can lead to slow mental development, and how a family found ways to help their child develop more fully. Enrique had a difficult birth. He was born blue and limp. He did not start breathing for about 3 minutes. As a result, he developed severe cerebral palsy. His body became stiff and made strange movements that he could not control. His head often twisted to one side and he had trouble swallowing. Enrique's mother loved him and cared for him as best she could. But as the years went by, he did not gain any control of his body. His mother kept him on the floor in a corner so that he would not hurt himself. He spent most of his young life lying on his back, legs stiffly crossed like scissors, head pressed back, looking up at the roof and the mud brick walls. By age 3 he had learned to speak a few words, but with great difficulty. By age 6 he spoke only a little more. He cried a lot, had temper tantrums, and did not control his bowels or bladder. In many ways he remained like a baby. A visiting nurse called him 'retarded'. Still lying alone in the corner, Enrique grew increasingly withdrawn. At age seven-if his mother understood him correctly-he asked her for a gun to kill himself. Soon after this, Enrique's mother and his older sister took him to a team of village rehabilitation workers in a neighboring village. The workers realized that he would probably never have much control of his hands and legs. But he desperately needed to communicate more with other people and see what was going on around him, to be included in the life of his family and village. But how could he do this lying on his back? His mother had tried many times to sit him in a chair, but his body would stiffen and he would fall off or cry. The village workers helped Enrique's family make a special chair for him, with a cushion and hip strap to help him sit in a good position. 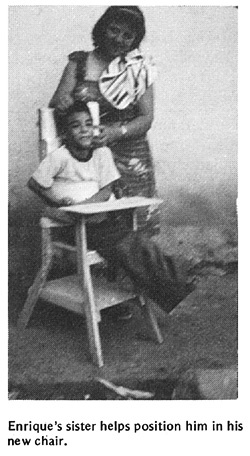 They taught his mother and sister how to help him sit in a way that would keep his body from stiffening so much. Later, they added wheels to the chair. With his new chair, Enrique was able to sit and watch everything that was going on around him. He was excited and began to take more interest in things. He could also sit at the table and eat with the family (although his mother still had to feed him). Everyone talked to him and soon he began to talk more. Although his words were difficult to understand, he tried very hard. In time, he spoke a little more clearly. He also began to tell people when he had to use his toilet. He discovered he was no longer a baby, and did not want to be treated as one. Every day Enrique's sister and brother went to school. One day Enrique begged to go too, and they pushed him there in his chair. Soon he went every day, and began to learn to read. Enrique had begun to develop more control of his head. The village workers helped the teacher make a book holder attached to Enrique's chair, and a head band with a wire arm so that he could turn the pages. A happier and fuller life had begun for Enrique. Enrique's story shows how development of the body, mind, and senses all influence each other. Enrique was slow to develop mentally because he did nothing but lie on his back in a corner. His mind did not have the 'stimulation' (activity, exercise, and excitement) it needed to grow strong. He had almost no control of his body movements. However, his eyes and ears were good. When at last his body was placed so he could see and experience more of the world around him, and relate more to other people, his mind developed quickly. With a little help and imagination, he learned to do many things that he and his family never dreamed he could. UNLESS special care is taken to help the child develop BOTH BODY AND MIND as fully as possible. But all children have the same basic needs. They need love, good food, and shelter. And they need the chance to explore their own bodies and the world about them as fully as they can. 'Stimulation' means giving a child a variety of opportunities to experience, explore, and play with things around her. It involves body movement and the use of all the senses-especially seeing, hearing, and touching. Early stimulation is necessary for the healthy growth of every child's body and mind. For the non-disabled child, stimulation often comes naturally and easily, through interaction with other people and things. But it is often more difficult for the disabled child to experience and explore the world around him. For his mind and body to develop as early and fully as possible, he will need extra care and special activities that provide easy and enjoyable ways to learn. The younger the child is when a 'stimulation program' begins, the less retarded or delayed he will be when he is older. In order to know how well a child is developing and in which areas she may need special help, we can compare her development with that of other children. An understanding of normal child development can guide us in planning activities that will help the disabled child progress. Every child develops in 3 main areas: physical (body), mental (mind), and social (communication and relating to other people). In each area, she develops skills step by step in a certain order. During the first year of life, normally a baby gains more and more control of her body. Before she can begin to walk, a baby needs to go through a series of developmental stages, or 'levels'. First, she has to be able to hold up her head and see what is around her. This encourages her to use her arms and hands so that she can then learn to lift herself to sit. While sitting, she begins to reach, lean, and twist. All this helps her to develop balance and to shift her weight from side to side-skills she will soon need for standing and walking. Normally, the stimulation that a child needs to advance through these stages comes from ordinary day-to-day interaction with people and things. From the first we should hold her and speak to her a lot. Help her to reach out to touch and feel different things. Later, we can encourage her to lift and turn her head, and then reach out, toward different sounds. When she begins to sit, again we can help her to recognize different sounds and reach toward them. When she begins to walk we can help her find her way with guide poles, and in other ways. For more ways to help a child who cannot see well, see Chapter 30. This is true even for an older child. Often parents of an older child who is delayed will try to help her learn more advanced skills (which other children her age are learning) before she is ready. This often leads to disappointment and frustration both for parents and child. For example, Nina is a 3-year-old girl with cerebral palsy. She still has trouble holding up her head or sitting without falling over. However, her mother is sure she is 'almost ready to walk'. Several times each day she holds Nina in a standing position and moves her forward, so that her feet take stiff, jerky steps on tiptoe. Her mother does not know that this stepping is an 'early reflex' normally only seen in young babies (see Page 311). It means that in some ways Nina's development is still at the level of a 1 - to 3-month-old baby. She is not yet ready to walk. Making her 'take steps' will only keep active the early reflex which she needs to lose in order to learn to really walk. Figure out what developmental age or stage the child is at. Decide what are the next steps forward, so that the child can build new skills on the ones she has now, in the same order in which a normal child develops. To do these things, Nina's mother should first observe the child carefully. In each area of development, she notes the different things Nina can do, the things she cannot do yet, and the things she is just beginning or trying to do, but still has trouble with. Next, her mother compares what Nina can and cannot do with what other children Nina's age can do. She can then decide at what level her child is at in each area of development, and what are the next steps to work toward. The chart on the next 2 pages shows some of the steps or 'milestones' of normal child development. You can use it to figure out where a child is in her development, and to plan the next steps that she needs help with. CAUTION: The development chart shows the average ages when children begin to do things. But the ages at which normal children develop different skills vary greatly. Just because a child has not developed certain skills by the ages shown does not mean he is backward or has a problem. Be sure to look at the whole child. find and record a child's developmental level. and record in which areas the child is progressing, and how much. Let us suppose that a village health worker wants to help Nina's mother figure out what she needs to do next to help her 3-year-old daughter develop early abilities. Together they look at the chart. First they put a circle around each of the things that Nina can do. Since she still has trouble holding her head up, they put a circle here. Nina needs help to roll from her belly to her back, so they put a circle that goes part way around 'rolls belly to back'. After they circle Nina's level in each area of development, they can see that in her general body movements and control, Nina is still at the level of a 2- to 4-month-old baby. Her hand control is at about 6 months. Her seeing and hearing seem about normal, and her mental development is at about 2 years. Then they put a square around the next developmental step after each circle. The squares show which developmental steps Nina now needs help with. Because Nina's poor head control is holding her back in other areas, they decide to work mostly with this (see Page 302), and also to help her with rolling and twisting her body (see Page 304). Perhaps they can begin to work with sitting and creeping, but probably she will not progress much with these until she gets better head control. The use of her hands is still somewhat behind for her age, but this may partly be because of her poor head control. So they decide to have her sit for short periods each day in a special seat. With her head supported in a good position, they can give her games and things to do to help her develop better use of her hands. But, they are careful not to keep her head supported for long, because that will not help her to learn to support it herself. Also, they are careful to provide only the least amount of support needed to give her better control of other parts of her body. They will reduce the support as her control improves. Because Nina's eyes, ears, mind, and speech seem to be developing fairly well, these will probably be what she learns to use best as she grows older. Therefore, her parents decide to do all they can to help her improve these skills. They use pictures, songs, stories, play, and a lot of stimulation to help her develop her mind. But they try to remember that she is still only 3 years old. They must not push her too much. Sometimes it is better to help her gain skill and confidence in only 1 or 2 areas at a time. The parents and family are the key to the development and early learning of any child. Children who are developmentally slow need the same stimulation (talking to them, music, games, adventure, and love) that any child needs. But they need more. They need more help and repeated activities to use their minds and their bodies. When a child is delayed, he needs stimulation and activities to help develop all areas of his body and mind. 1. Movement, body control, strength, and balance: these will help the child move about, do things, play, and work. 2. Use of the hands: increased hand control, and coordination of the hands with what the child sees, allows the child to develop many skills. 3. The senses: especially seeing, hearing and feeling. These will help the child recognize and respond to her world. 4. Communication: listening, understanding what is said, and learning to speak, or to communicate in whatever way is possible. 5. Interaction with other people: smiling, playing, behaving appropriately, and learning to 'get along' with others. 6. Basic activities for daily living: eating, drinking, dressing, and control of bowel and bladder (peeing and shitting). These 'self-care' skills help the child become more independent. 7. Observing, thinking, and doing: to learn how to make thoughtful, intelligent decisions. The goals of an early stimulation program are to help the child become as able, self-sufficient, happy, and kind as possible. Observe the child closely to evaluate what he can and cannot do in each developmental area. Notice what things he is just beginning to do or still has difficulty with. Decide what new skill to teach or action to encourage that will help the child build on the skills he already has. Divide each new skill into small steps: activities the child can learn in a day or two, and then go on to the next step. Be patient and observant. Children do not learn all the time; sometimes they need to rest. When they are rested, they will begin to progress again. Observe the child closely. Try to understand how she thinks, what she knows, and how she uses her new skills. You will then learn how to help her practice and improve those skills. When talking with the child, give her time to answer your questions. Take turns speaking. Remember that practice and repetition are important. Be orderly and consistent. Plan special activities to progress naturally from one skill to the next. Try to play with the child at about the same time each day, and to put his toys, tools, clothes, and so on, in the same place. Stay with one style of teaching, loving, and behavior development (if it works!). Respond in a similar way each time to the child's actions and needs. This will help him to understand and to feel more confident and secure. Use variety. While repetition is important, so is variety! Change the activities a little every day, so that the child and her helpers do not get bored. Do things in different ways, and in various places inside and outside of the house. Take the child to the market, fields, and the river. Give her a lot of things to do. Be expressive. Use your face and your tone of voice to show your feelings and thoughts. Speak clearly and simply (but do not use 'baby talk'). Praise and encourage the child often. Have a good time! Look for ways to turn all activities into games that both the child and you enjoy. Be practical. Whenever possible choose skills and activities that will help the child become more independent and be able to do more, for himself and for others. To help prepare the child for greater independence, do not overprotect him. Be confident. All children will respond in some way to care, attention, and love. With your help, a child who is delayed can become more able and independent. A special learning program, if well-planned and carefully done, can help a delayed child progress much more than she would without help. How a family member or rehabilitation worker relates to a child when trying to teach her new skills can make a big difference in her whole development. It can affect how fast or well she learns the new skill. More importantly, it can influence the child's confidence, behavior, and readiness to learn. There are a few simple methods that you can use to help a child gain a better understanding of her own body, prepare her for learning language, and help her relate to other persons in a friendly, cooperative way. 1. Praise the child a lot. Praise him, hug him lovingly, or give him a little prize when he does something well (or when he makes a good effort). Praising success works much better (and is much kinder) than scolding or punishing failure. When the child tries to do something and fails, it is best to ignore it or simply say something like: "Too bad, better luck next time." CAUTION: Avoid giving sweets or food as prizes - especially if the child is fat (see box on Page 340). 2. Talk a lot to the child. Using clear, simple words, say everything that you do with him. 3. When you are helping a child learn a new skill, guide her movements with your hands. It usually works better to gently guide the child than to tell her how to do something. If she tries to do something but has difficulty, guiding her hands so that she is successful will make her a lot more eager to learn the skill than if you say "NO-do it like this!" 4. Use a mirror to help the child learn about his body and to use his hands. 5. Use imitation (copying). To teach a new action or skill, do something first and encourage the child to copy you. Turn it into a game. 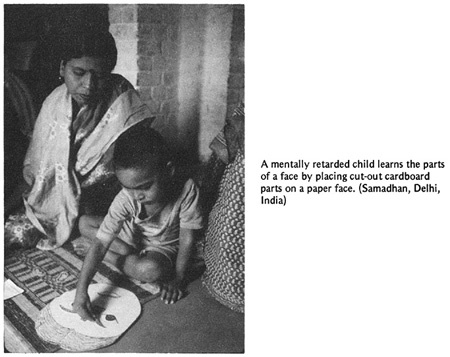 Many retarded children (especially those with Down syndrome) love to copy or imitate the actions of others. This is a good way to teach many things, from physical activities to sounds and words. 6. Encourage the child to reach out or go for what he wants. When it gets too easy, put obstacles in the way-but do not make them too difficult. Even at early stages of development, it is a mistake to always place in his hands what a child wants. Instead, use the child's desire as a chance to have him use his developing body skills and language skills to get what he wants-by reaching, twisting, rising, creeping, or whatever he is learning to do. 7. Make learning fun. Always look for ways to turn learning activities into play. Children learn best and cooperate more when they enjoy and are excited by what they are doing. Keep doing an activity as long as it is fun for the child. As soon as it stops being fun, stop the activity for a while, or change it in some way, to put new adventure and excitement into it. 8. Let the child do as much as she can for herself. Help her only as much as is needed. For example, if the child has trouble putting on clothes because of spasticity, help by bending her shoulders and back forward, but let her pull on her clothes herself. This is the "Golden Rule of Rehabilitation." When a child has trouble doing something or seems slow or clumsy at it, parents often want to 'help' by doing it for her. However, for the child's development, it will help her more to let her do it herself -providing encouragement but assisting only in ways that let her do more for herself. 9. The child often learns best when no teacher is present. Children often try hardest when they want something a lot, and no one is there to help. Teaching is important, but so is giving the child a chance to explore, test his own limits, and do things for and by himself. 10. Get older brothers and sisters to demonstrate new equipment. Some children may refuse to try, or will be afraid of new playthings, aids, or special seating. If another child tries it first, and shows he likes it, the child will often want to try it also. REMEMBER: Good teaching will make a difference. How well you teach, play, and express affection is more important than how much time you spend at it.